This is an excellent choice for gathering neural data from a wide range of animal subjects, from free-swimming aquatic, all the way up to ambulatory primate. Wires connect the commutator to electrodes implanted in, or affixed to, the subject. The commutator swivels freely with each animal movement, as a result prevents lead wires from tangling. When mounted in (or above) the ceiling of the testing chamber it permits continuous full rotation in any horizontal direction. Thanks to the minimally perceptible torque, the SwivElectra™ commutators afford subjects freedom of movement while affording researchers the peace of mind that data is reliably captured. Gold rings and palladium brushes deliver the highest quality signal and data transfer. Current is rated at 1 amp per ring. The SwivElectra™ is compatible with most fluid swivels through a central cannula tube. SwivElectra™ commutators are available in sizes ranging from 1 to 36 channels. The output connections on this commutator are sub D receptacles. Connectors are available in 9 pin, 15 pin, 25 pin, and 44 pin formats. The Smallest production Unit is the 9 Channel SwivElectra™ Commutator is the smallest production unit, Yet it has lowest torque resistance. The extremely free-moving rotation is especially well-suited to small animals, including mice and a variety of free-swimming aquatic and amphibian species. Two female 9-pin Amphenol Type Receptacles are provided on the 4-TBC-9S. The Smallest production Unit is the 9 Channel SwivElectra™ Commutator is the smallest production unit, Yet it has the lowest torque resistance.Well suited for small animals, with its free moving rotation. This includes mice and a variety of free-swimming aquatic and amphibian species. Two female 15 pin d sub Type Receptacles are provided on the 4-TBC-10S. Made from the larger 4-TBC-25 commutator, and operating in the same manner, this model is configured with a center-mounted cannula that enables introduction of fluid during stimulation and/or recording. The 4-TBC-9-LT commutator also includes the same 9-pin connectors as the 4-TBC-25 unit. 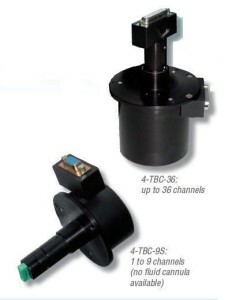 This model, which operates in the same manner as the 4-TBC-9S configuration, offers more channels to deliver enhanced data acquisition and transmission. This is a larger unit than the 4-TBC-9S yet torque increase is minimally perceptible compared to the 9-pin configuration. Two 25-pin receptacles are provided on the 4-TBC-25. This product configuration includes a cannula in the 4-TBC-25 for ease of introducing fluids. This version of the product offers a 44-pin connector to accommodate 26 to 36 Channels.